This FREE item is a wonderful resource for Kindergarten, Early Years, and Primary educators. 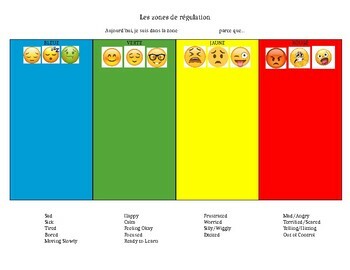 It teaches students the different colours of the Zones of Regulation along with kid-friendly emojis attached to each colour to help students understand the difference. It can be used as a morning sign-in to help students check-in and self-regulate. It can also be used as a tool for small or whole group discussions. This resource is bilingual and perfect for French Immersion learners.